Miriam is a knitter who crochets. Amy is a crocheter who knits. 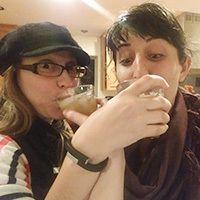 We both came to crochet first, as children, and we both learned to knit about fourteen years ago. 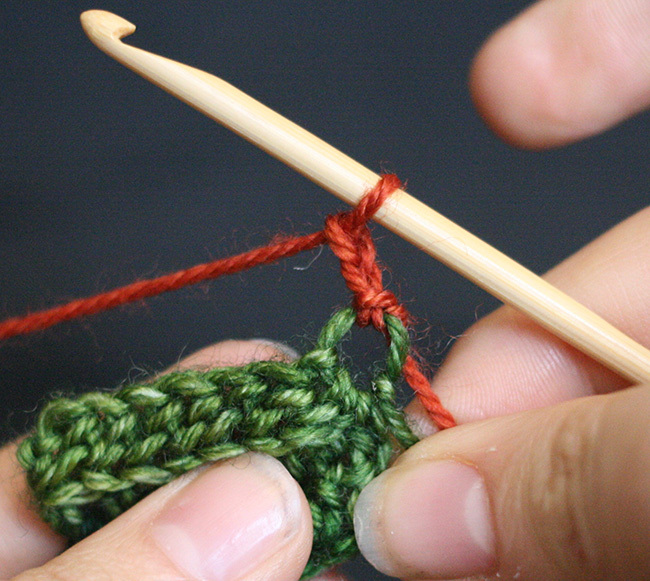 We share an appreciation for the inherent beauty of both knitting and crochet. Miriam loves lace and designs intricate patterns that enthrall knitters with their form and flow. 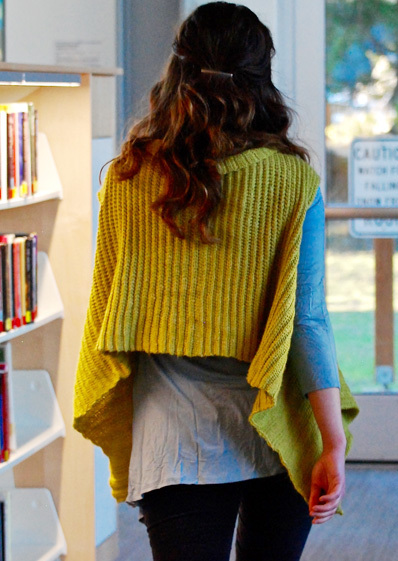 She's designed over two dozen shawls including two published here on Knitty. Amy designs crochet garments that combine fit and wearability with captivating constructions. She has a particular fondness for hats. 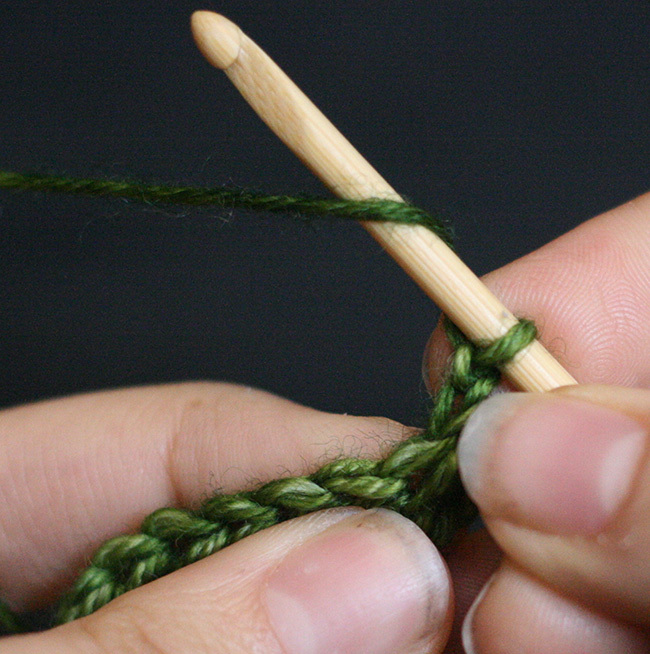 Amy naturally picks up a hook when she's thinking of designing something new, and Miriam reaches for her needles, but we each enjoy the challenges of both knitting and crochet. Fiber terminology can be quirky. The half-double crochet, which makes its Knitty debut here in Mod Waterfall, is a good example. 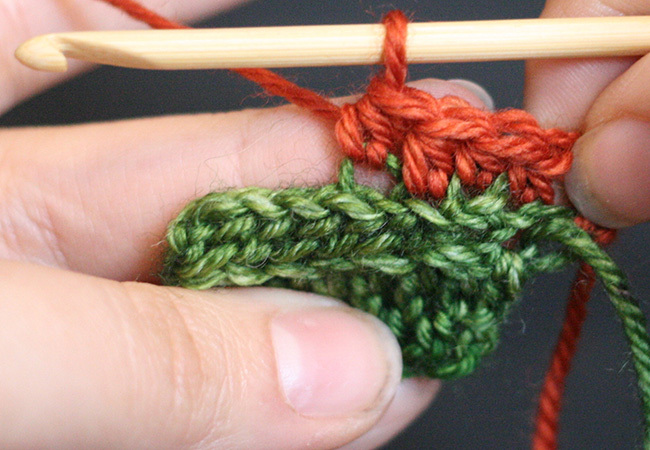 Half-double isn’t really half of a double — it’s the middle-height stitch that strikes a balance between the solid fabric created with a single crochet and the height you get with a double crochet. It’s squishy and round, but makes a fabric with a bit more drape than a single crochet. 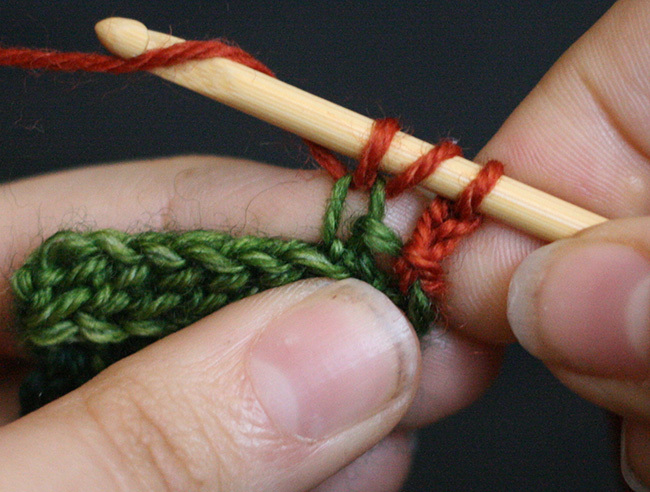 It doesn’t have gaps between stitches the way double crochet does. 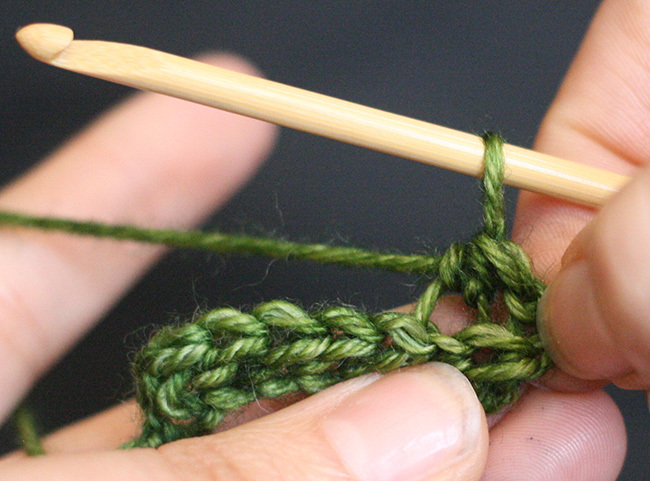 We love half-double crochet because its flexible and great for making stretchy wearable fabric. 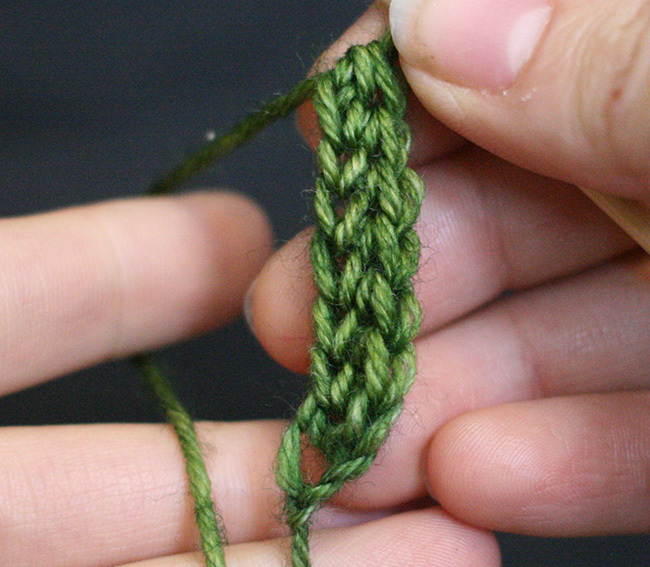 We've talked about single crochets (sc) which are one chain tall, double crochet (dc) which are three chains tall, and in the last installment we learned how to do a treble crochet (tc), which is 4 chains tall. But what about a stitch that's 2 chains tall? That's a Half-Double Crochet (hdc)! It's really a hybrid between a sc and a dc. 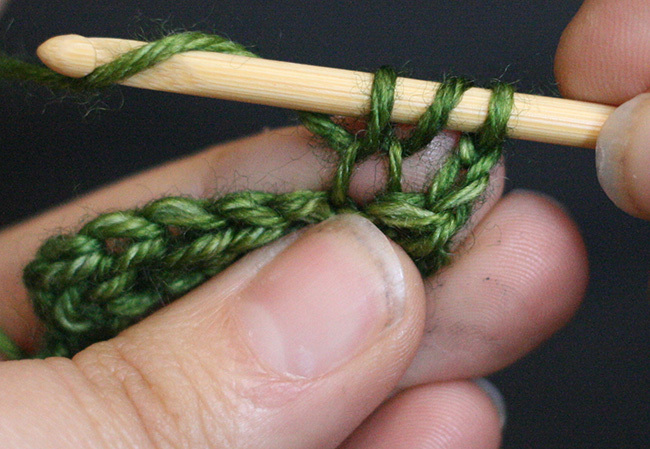 You start with a yarnover like a double crochet. 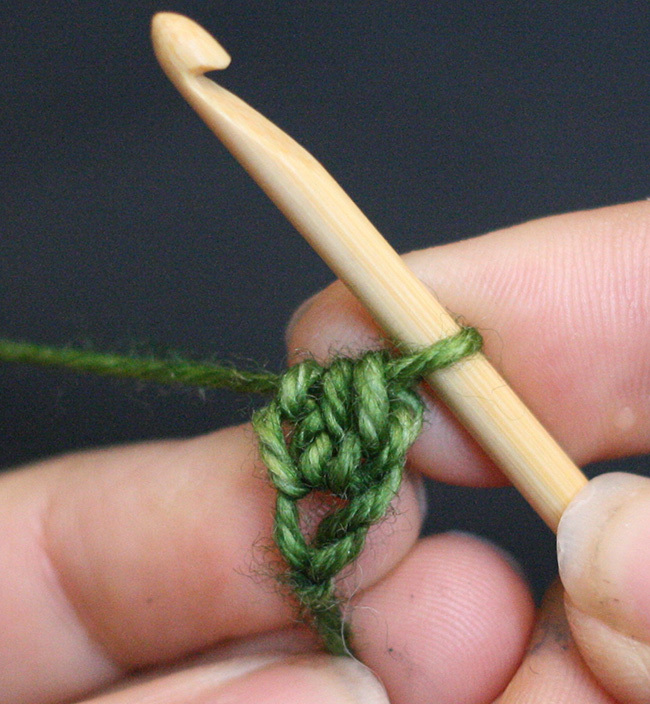 Then insert your hook (in this case, through the back loop only) and pull up a new loop. 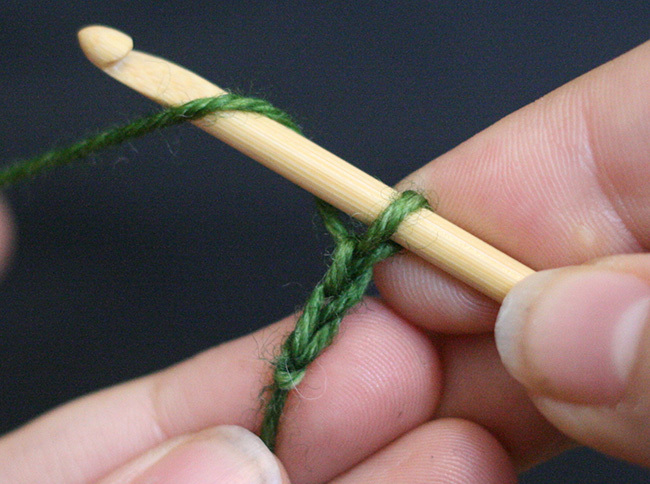 Yarnover. 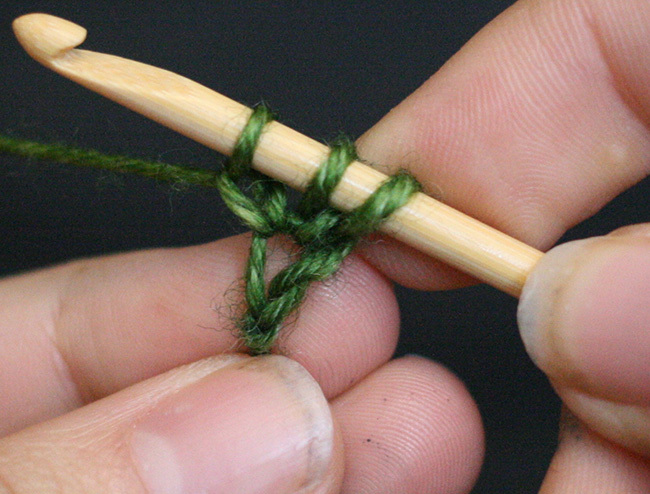 This leaves you with 3 loops and a yarnover on your hook (just like a double crochet), but from here, you pull the yarnover through ALL 3 loops. Half-double crochet makes a really great fabric. The post (the upright stitch) of each hdc is less airy and floppy than a double crochet, and not as dense as a single crochet. And when you work all your hdcs in a flat fabric through the back loop only, you get horizontal ribbing. 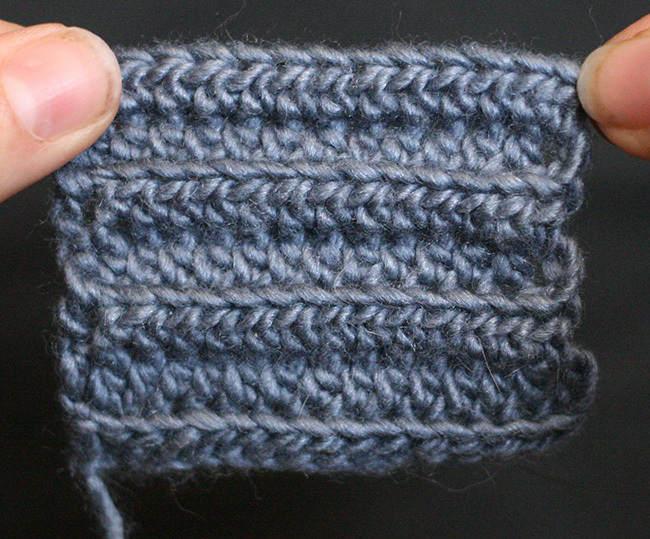 The fabric has a corrugated cross-section, similar to knitted ribbing. And just like ribbing or stockinette, its a great reversible fabric! The Waterfall Vest begins with a foundation hdc (fhdc). 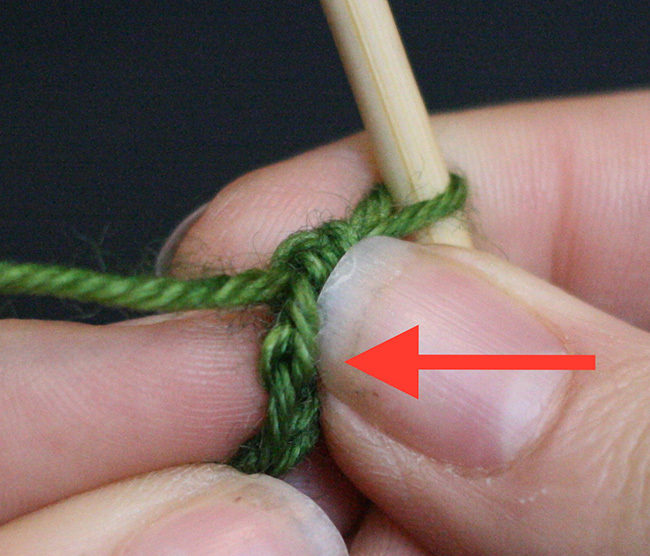 We've talked about foundation double crochet before, and the technique is similar. Start with 2 chains on your hook. Yarnover. 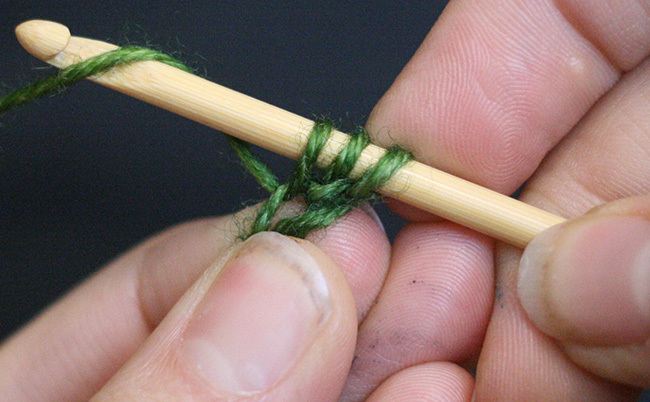 Insert your hook into the first chain, and pull up a loop, so you have 3 loops on your hook, then yarnover. Then yarnover and pull through all 3 loops to make the hdc. For the next (and all future fhdc), insert your hook into the foundation chain from the previous fhdc, ch1, then yarnover and pull through all 3 loops on the hook. 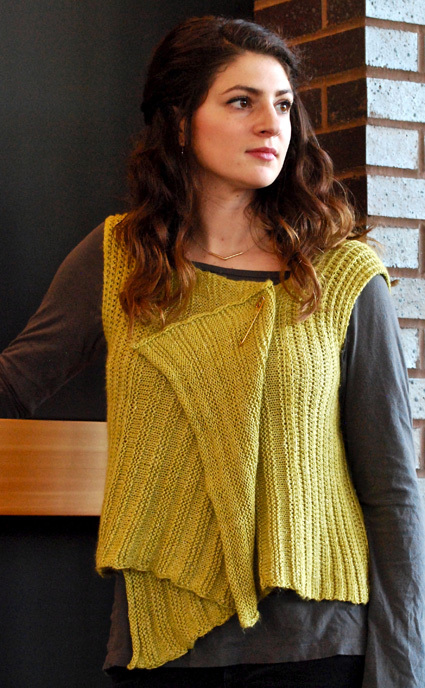 The Waterfall Vest is inspired by the construction style in Modular Crochet by Judith Copeland, but it updates the form by using a foundation hdc which acts like a provisional cast on in knitting, and allows you to work out from the foundation in both directions. Then work a hdc into the back loop of the foundation side of the row. And work in that way all across the row. Mod Waterfall is an unstructured vest made of simple rectangles. The finished piece is shawl-like and subverts its rectangular shapes with lots of drape and flexibility in wearing. Play around with wearing. I like to lean towards asymmetry if I pin Mod Waterfall closed. Open or closed, I sometimes turn the back neck to make a bit of a collar. The vest’s construction pays homage to one of my favorite designers from the 1970s, Judith Copeland. Copeland’s classic book, Modular Crochet, has just been re-released by Dover Publications, and I encourage you to check it out. Her designs are nothing like Mod Waterfall, but they embody a cozy, patternless sweater style you can endlessly adapt. The modular style of crochet is so called because garments are built in seamless sections that grow from the center outward. The back of Mod Waterfall is created with a row of foundation half double crochet that is then worked from the center outward on both sides. The fabric is turned on its side, meaning your row edges become the neckline and waist edges of the garment. Note: This pattern is designed to be worn with about 4” of positive ease in each size. Choose your size by taking your cross back measurement and adding 4 inches. Shawl pin for wearing. Mod Waterfall is photographed with a kilt pin fastening the fronts in some shots – a shawl pin would work just as nicely, and both give lots of flexibility in wearing. It’s important to block your swatches for this pattern, especially the crochet swatch. The pattern yarn is relatively inelastic and the crochet section stretches in row gauge with washing by 15-17%. Mod waterfall is reversible. The crochet is actually the same on both sides, and even though the knitted fronts look different from either side, the waterfalling fronts mean you see both sides, and it can be worn both ways for varying effect. Therefore, in the instructions, I refer to side A and Side B instead of left and right. Sizing and Shape: Mod Waterfall is simple and flexible. See Sizing Notes in the pattern that tell you how to easily modify for a different fit. Fhdc 85[85, 85, 89, 94, 94, 94] sts. Sizing Note: Mod Waterfall is designed to fall 3” below the natural waist. If you want a longer vest, here’s where you’d make that change. Just add approximately 4.25 sts per inch, and be sure to carry that measurement across when adding front stitches (below). 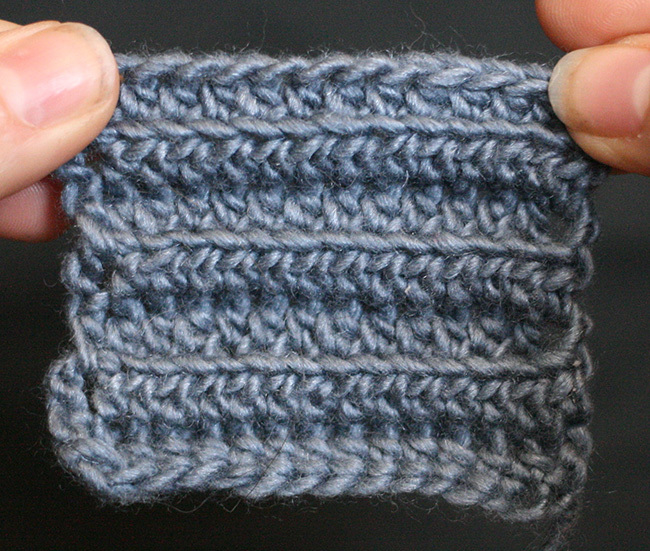 Ribbing Pattern: Ch2, hdc-blo across, turn. Work Pattern for 4.75[5.25, 6, 6.5, 7.25, 7.5, 8.5] inches. Do not turn after end of last row. This end becomes the Neck Edge. In last stitch of final row of Center Back side A, yo, insert hook into bl, pull up a lp, ch 1, yo, pull through all lps. Continue to fhdc for 89[89, 89, 93, 98, 98, 98] stitches total. Place a marker in the last fhdc. This marks the waist edge of your garment Front. 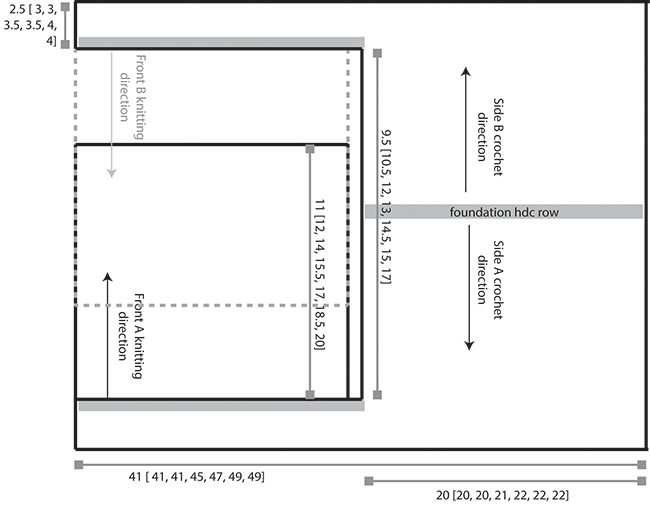 Sizing Note: If you modified the length, just make sure to fhdc the length of your foundation +4 sts. Ch 2, work in Ribbing Pattern across all 174[174, 174, 182, 192, 192, 192] stitches until front measures 2.5[3, 3, 3.5, 3.5, 4, 4] inches. Fasten off. At the waist edge of the center back – at the base of the foundation chain, at the opposite edge to the neck edge – insert the hook and slip stitch into the first stitch of the back side of the foundation row. Ch 2, work in Ribbing Pattern for 4.75[5.25, 6, 6.5, 7.25, 7.5, 8.5] inches, ending at Neck Edge. Work neck and front as for Side A. Then work shoulder and front as for Side A.
Sizing Note: if you modified the length of your Mod Waterfall, be sure to carry your new length over to Side B. Starting at the waist edge, (opposite to the neck edge) of the front of Side A, and working into the back side of the foundation row of your front sts, join yarn and pick up and knit 83[83, 83, 87, 92, 92, 92] sts. Sizing Note: if you’ve modified the length, work the same # of sts as your back sts, less two. Repeat Rows 1-10 for pattern. Work in Welt Pattern until knitted section is 11[12, 14, 15.5, 17, 18.5, 20] inches. End by working Rows 1-3 of Welt Pattern, then bind off. With RS together, and beginning at waist edge, using US F/3.75mm hook, loosely slip st Front to Back, inserting hook into back lp of Front sts, and front lp of Back sts. Work until the opening measures 7[7, 7, 9, 9, 9.5, 9.5] inches. Try on before fastening off. Adjust armholes to your comfort. Sizing Note: This is a good place for a sizing check. You can easily make the armhole as big as is comfortable. Don’t fasten off until you’ve tried the vest on. Armholes shouldn’t be overly loose, but snugly comfortable. They will stretch slightly with blocking. Soak with wool wash in cool water, then rinse gently. Squeeze out excess water, roll in a towel to remove more water, then lay flat, evening edges to dry straight. Amy O'Neill Houck blogs at thehookandi.com and tweets @plainsight. Miriam can be found on on the web at miriamfelton.com, and on Twitter @mimknits. Amy and Miriam both have patterns on ravelry.com.